Kitchen are natural places for pests to thrive, being warm and providing food and water. Kitchen pests include cockroaches, moths and a number of tiny beetles. Most of us will encounter stored product pests from time to time. Many insects – particularly moths and beetles – contaminate and feed on cereals, grains, nuts, dried fruits, spices and processed foods. So where do these infestations come from? Some products might already be infested when purchased. For example, purchasing and bringing home bird seed is an easy way to start an Indian Meal Moth infestation. You may even see these little moths flying around the bird seed aisle in the pet store. The extra protein won’t harm birds, but once inside it is very easy for the infestation to spread to other stored foods in the pantry. Another scenario is for insects to enter through window screens, finding their way into the pantry. 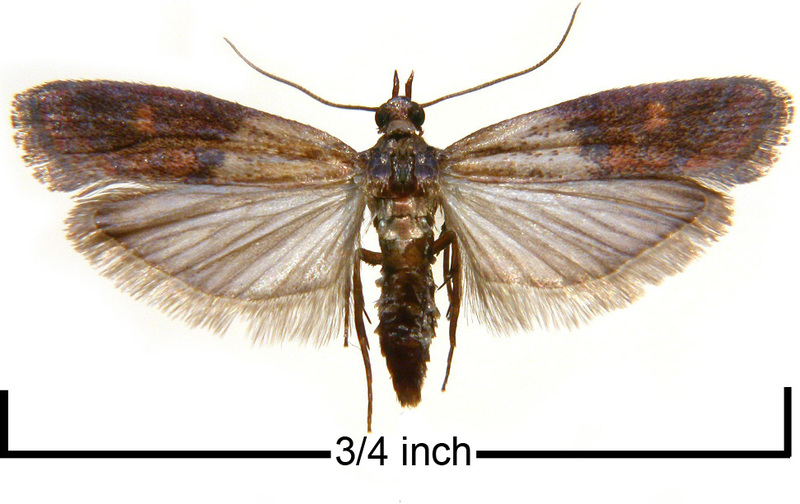 The first stage of moth infestations start out as small, light-colored worms that produce dirty webbing which contaminates the surface of food. After feeding, mature worms (about ½ - 1 inch long) often leave the food and spin a small silken cocoon in cracks and secluded places. They emerge from the cocoon as adult moths that lay eggs and re-infest foods. This small, flattened beetle is about 1/10th inch long. It has six saw-like teeth on each side of the prothorax, though this may be difficult to identify without a lens. Its varied food preferences make it one of the most common kitchen pests. It prefers processed grains, oats, pet food and seeds, but also feeds on rice, cereals, dried fruits, breakfast foods, grain meals, sugar, chocolate and pastas. These small, robust beetles infest a wide range of processed foods, including dry pet food, cereals, spices, drugs and other packaged foods. They also attack tobacco. They can chew through tin foil and penetrate most food packaging materials. Store grain-based products and nuts in glass or plastic containers with tight fitting lids to help protect food. 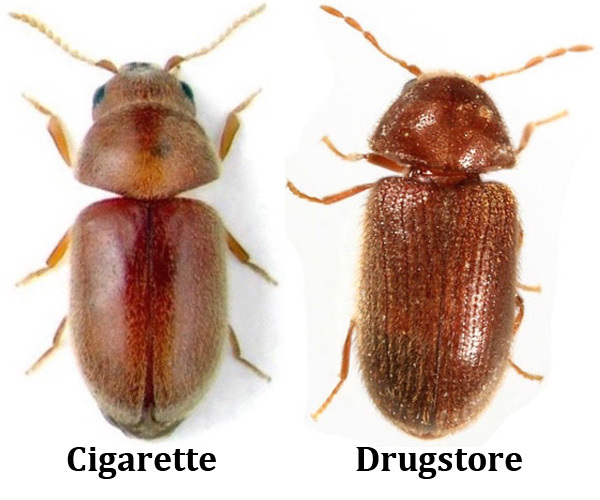 Small beetles can chew their way through cardboard or plastic, so unopened packages are not pest proof. This protects foods from getting infested and kills insects already in stored foods. Refrigerators will also protect non-infested food, but may not kill insects if the food is already infested. Cook food in the oven at 140° F for an hour to destroy infestations. Pheromones are emitted by female insects to attract males. The pheromones have been synthesized by scientists and incorporated into traps. Only male insects are attracted to these traps, but it is a way to monitor infestations and passively reduce much of the population. Locating the infestation is still needed to solve the problem. Throwing away infested foods is the best approach for controlling beetle and moth infestations. Using insecticide sprays inside pantries is not recommended. Our kitchens are warm, have food and water sources. They are natural places for some pests to thrive. Kitchen pests include cockroaches and a number of tiny beetles and moths that infest stored food in our pantry. Most of us will encounter stored product pests from time to time. Treatment of the entire interior of the structure (living room, bathroom, bedrooms), treatment of baseboards, kitchen cabinets, bathroom cabinets, and inside closets (when needed) with a residual product that includes an insect growth regulator to prevent any further infestation. Treated with a fogger type product with a flushing agent to eliminate all present pantry pests on contact, giving a fast pantry pests control. A licensed technician will apply dust & bait type treatment inside the kitchen & bathroom walls inside the outlets for longer residuals. Also, in addition, technician will apply pantry pest bait and dust inside crack & crevice inside kitchen and bathroom cabinets for extra control. This product and treatment are also known to work for general pests (ants, roaches,silverfish, spiders, earwigs, crickets and beetles).